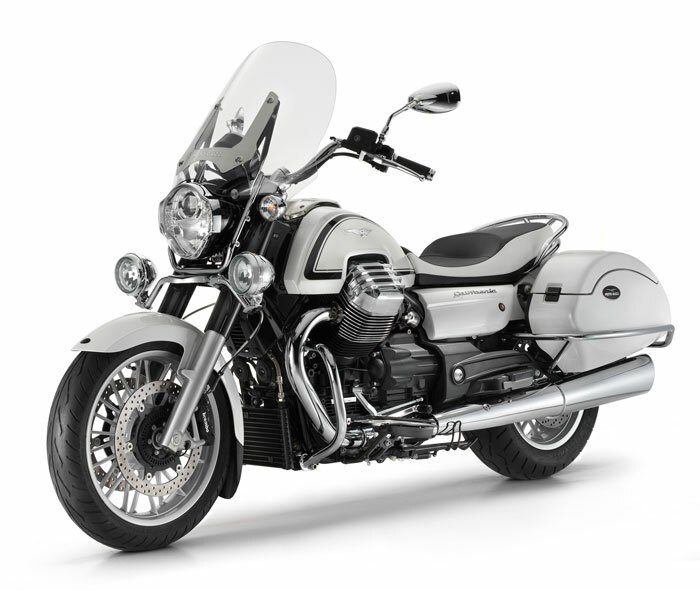 The emblem of a culture and capability of building unique bikes since 1921, the California 1400 Touring is assembled by hand in the Mandello del Lario plant and, with its innovation and style, represents the turning point in Moto Guzzi history, one of the oldest and most respected brands in motorcycle history. ” The largest V Twin ever made in Europe, able to produce an explosive torque of 120 Nm at just 2750 rpm. 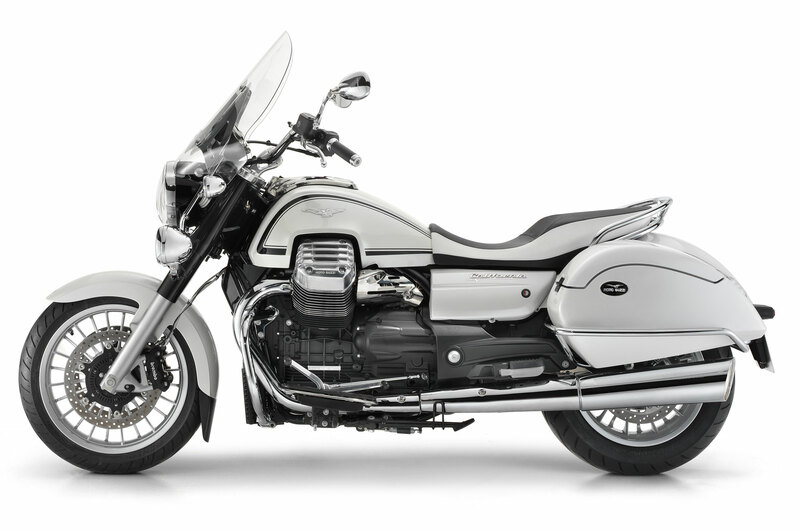 Equipped with a “Patrol” windscreen, supplementary chrome-plated headlights, 35 liter panniers, engine and pannier guard kit, the Touring is a lavishly chromed and technological “tourer” which, powered by the largest V-twin ever seen before in Europe, is able to trot along all day with a thrilling sound and, if necessary, leave behind any vehicle on two or four wheels. High performance silencers, chrome-plated and machined components, saddles of all types and materials, as well as support and the App which turns an iPhone into a supplementary dashboard to obtain all kinds of navigation, performance and technical data information. 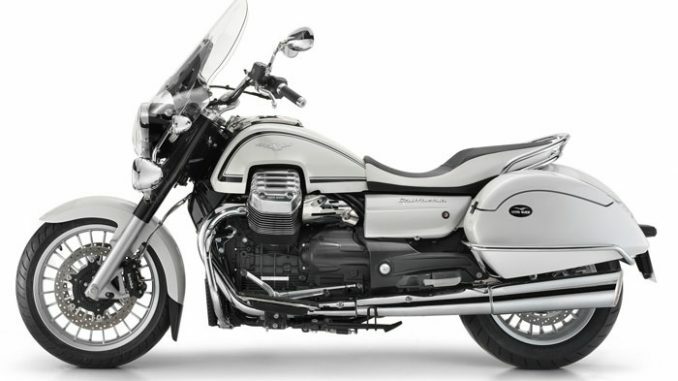 Special attention has been given to the chromatic concept, developed in two colors: white with dark decorative threads on the tank, inspired by the California Highway Patrol versions, or classic black with white threads, reminiscent of the original versions, such as the V7 and 850 California. 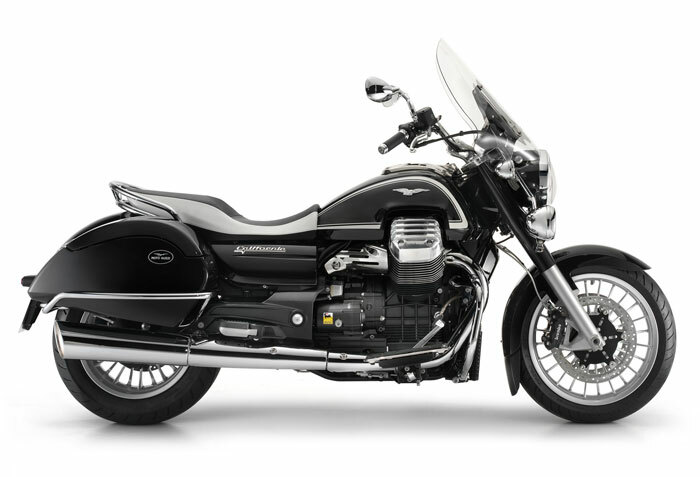 Making its dÃ©but on a Moto Guzzi and in the custom segment, is the ride by wire electronic engine management system. This technology allows the rider to choose from three engine management mappings: Turismo (Touring), Veloce (Fast) and Pioggia (Rain). CHOOSE THE BEST TO MAKE IT PERFECT AND UNIQUE. There is only one way to make a unique bike like the California 1400 Touring even more rich and luxurious: customise it with original Moto Guzzi accessories. For those looking for greater riding comfort, a saddle with a gel insert is available. Both the rider and passenger enjoy this comfort thanks to the gel inserts placed specifically in the saddle seating areas. Finished in two-tone colours to match the top of the range outfitting of the bike with “comfort gel” embossed on the side. The saddle is the same height as the factory model. Lowered gel comfort two-seat saddle. This saddle combines gel comfort with the convenience of a revamped and lowered profile in order to give the rider more secure footing on the ground. This peculiarity combines with the different foam design which ensures an every more familiar feeling with the bike. The passenger enjoys the same comfort with a gel insert placed specifically in the saddle’s rear seating area. Finished in two-tone colours to match the top of the range outfitting of the bike with “comfort gel” embossed on the side. Spacious fibreglass top box (60 litres) painted to match with chromium locks and handles built into the upper shell half. It has a large and comfortable backrest cushion for the passenger, covered in the same material and colour as the saddle. The interior is finished in velvet and has a mirror and a cargo net. Air deflectors to be applied at the bottom area of the windshield to increase protection and riding comfort for the rider. “custom”, slip-on exhaust pipes were made with a style similar to the factory exhaust but with a dedicated finish and specific bottom. 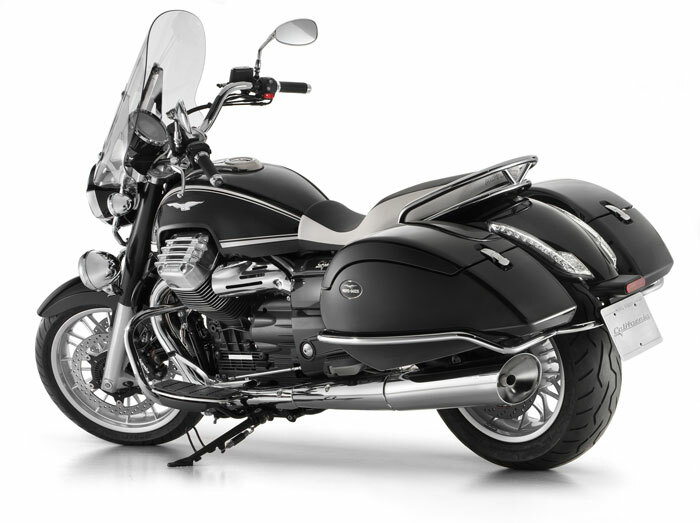 To allow an exclusive personalisation of your bike a black chromium handlebar is available. This handlebar was developed by our testers to maintain an optimum riding position to control your bike. Special approved rear-view mirrors made in billet aluminium with polished, scratch-proof finish. The tank side covers, chromium plated with a polished finish, personalise the style of the bike, making it a true “custom”. Tilting rider footpegs made from mirror polished billet aluminium, they maintain the same riding ergonomics as the factory pegs, but provide a lighter and more personalised design in line with the bike’s style. Tilting passenger footpegs made from mirror polished billet aluminium, they maintain the same design as the rider pegs and integrate perfectly with the bike’s style. They can be adjusted horizontally to four positions by means of a sophisticated spring mechanism that facilitates optimum positioning, ensuring travelling comfort. This mechanism ensures maximum safety, thanks to the quick release which, in the event of impact with the rider’s leg, automatically moves back to free the leg. Tailor-made cover for indoors to protect against dust, intended for use during long periods of storing the bike in a garage. It is made from an elasticised two-coloured fabric with graphics dedicated to the bike. Available in two versions – with or without top box.